Dates and times and information for Changing The Queen's Life Guard at Horse Guards Parade in London. Schedule For Changing The Queen's Life Guard. The Queens Life Guard are scheduled to Mount Daily in April 2019. Timings for the Ceremony: 11:00 Monday - Saturday and at 10:00 on Sundays. The cereremony for changing 'The Queen's Life Guard' lasts about 30 minutes. 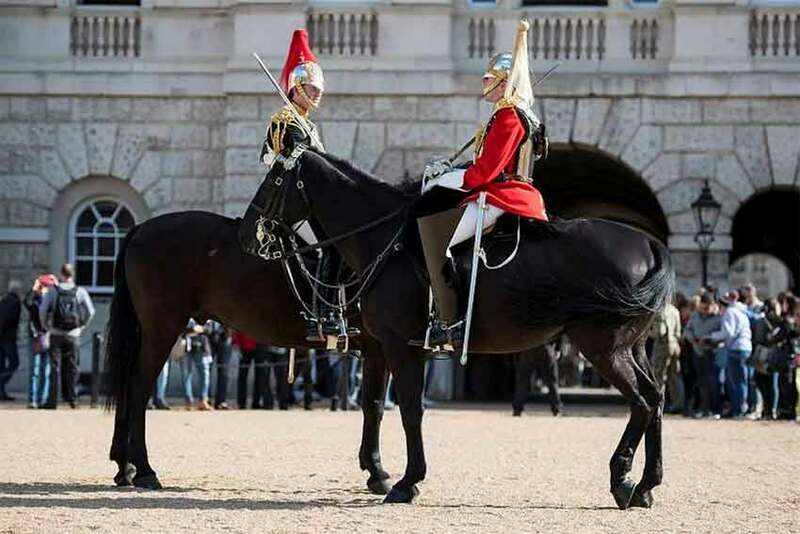 At 16:00 a Dismounting Ceremony, known as the 4 o'clock Parade or Punishment Parade takes place, on the forecourt of Horse Guards, when dismounted sentries are posted and the horses returned to their stables. In the event of heavy rain The Queen's Life Guard change inside the stables. Members of the public, who purchase tickets to the Household Cavalry Museum, can see the men and horses through a glass screen in the museum. Horse Guards Parade, is a large parade ground off Whitehall in central London. As well as being the venue for changing The Queen's Life Guard it is also the location for The Queen's Birthday Parade, the Trooping the Colour Reviews, Beating Retreat and other military parades. We use social media to share updates to the Changing Guard ceremonies. By Car - Not recommended, Whitehall is in the congestion charge zone parking is difficult to find and expensive. The Queen's Life Guard leave Hyde Park Barracks at 10:28 weekdays and 09:28 on Sundays to ride to Horse Guards Parade via Hyde Park Corner, Constitution Hill and The Mall on their way to the Changing the Queen's Life Guard ceremony. 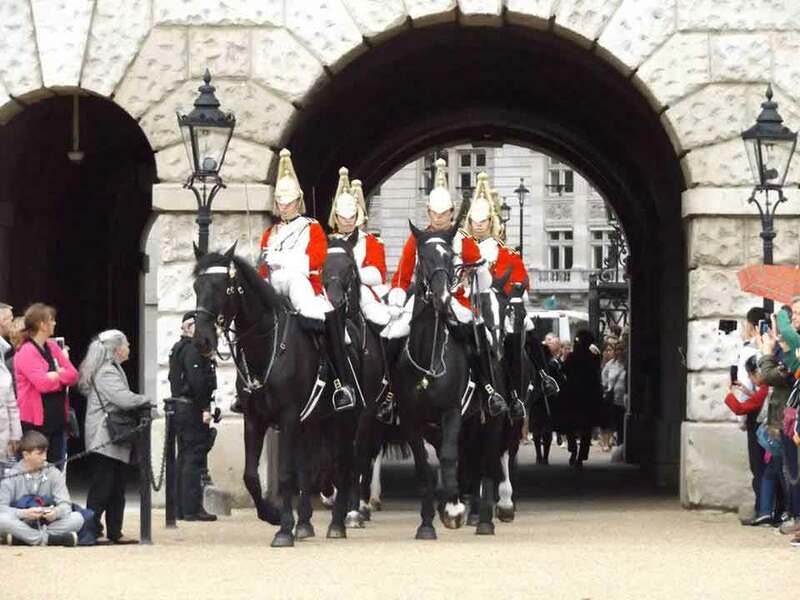 Life Guards: have stood guard at Horse Guards, since 1660. The ceremony to change The Queen's Life Guard has remained virtually unchanged for centuries. On a Royal Tour, with Fun London Tours, the highlight is watching The Queen's Life Guard mount on Horse Guards Parade. On the way you will see two royal palaces, as well as Prince Charles' residence, hear stories of revolution, execution, royal romance and scandal. Learn more about the Household Cavalry and their combat and ceremonial role.